I used to travel a lot. For 20 years I was a platinum frequent flyer, hotel staff knew me by name, I knew every shortcut in every airport in every capital city of Australia. Yet it was only quite recently that I learned the truth about hotel towels. Anyone who has stayed in a hotel or motel anytime since 1980 will recognise the little sign in the bathroom imploring your respect of the environment. Save water, save chemicals going down the drain and into the ecosystem, it says. Save the generation of surplus electricity for washing and vacuuming and save the hotel a buck or two at the same time. You can do all this by re-using your towels rather than having them swapped for fresh ones. I hung the towels up, as instructed, in just about every place I stayed, to re-use them. After all, this is what I do at home. 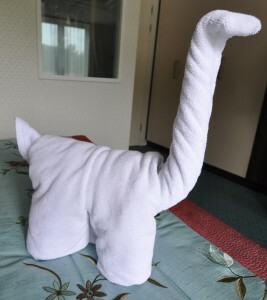 And despite this, in the bulk of hotels my old towel was swapped for a fresh one anyway. Recently I struck up a conversation with the maid who made up my room where I was staying. She was a local and I had the normal city-slicker syndrome of wanting to move to her gorgeous little town, so we chatted about what life was like 100 km from the nearest McDonalds. And then I noticed she was putting a fresh towel in the bathroom despite my old one having been neatly hung, so I asked her why hotel maids did this. And now her job may be on the line. There’s a growing trend among hotels and motels in the United States to offer customers an incentive – usually a discount voucher for the restaurant or bar, or bonus loyalty points – if they agree to forego having their room made up. Some places will even plant a tree. This is old news to me. I frequently stay at a small inner-city hotel where the rooms are made up only after your third night there. Stay three days and you return to the room in whatever condition you left it. I like this because it makes the place a bargain. But in the US the lack of room maintenance is sold as an environmental benefit and it’s proving popular. One study suggests 13 per cent (and rising) of American travellers select their travel and accommodation specifically on environmental grounds and 38 per cent say they would be willing to pay more for hotels, airlines and ground transport that demonstrates environmental responsibility. Business travellers seem to be embracing the idea far faster than holiday travellers. And some hotels, especially resorts, say that lots of customers don’t want their rooms made up anyway – they’d rather be left alone in their rooms without having to bolt the door against housekeeping staff that invariably knock, wait three seconds and then stride into the room no matter what. 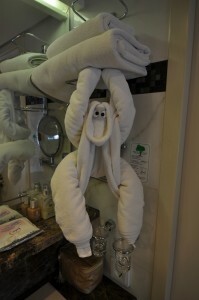 By the way, the pictures of creative towel replacement were taken on an APT cruise in Europe. 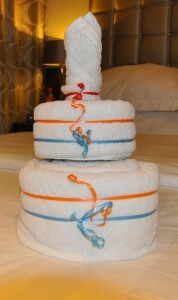 Every day the maid left a new towel design, including a birthday cake on my birthday.